I noticed this oddly self-contradictory message on a box in a shoe store. 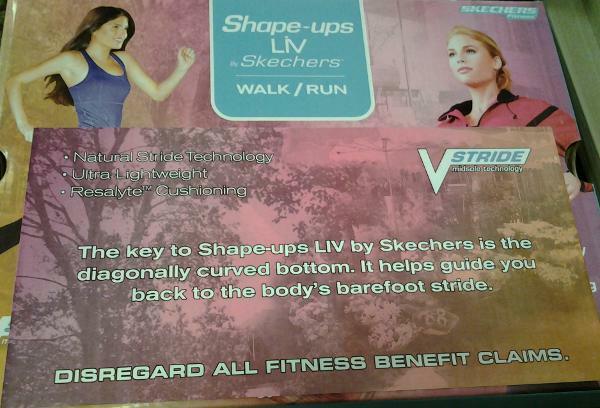 The key to Shape-ups LIV by Sketchers is the diagonally curved bottom. It helps guide you back to the body's barefoot stride. DISREGARD ALL FITNESS BENEFIT CLAIMS. Doesn't the second paragraph contradict and cancel out the first one? I was curious, so I did a little poking around. But all I found was accounts of Sketchers being pressured to pull an advertisement aimed at teen girls, in which it makes different claims regarding a different Shape-up shoe. Supposedly the advertiser was also putting stickers on shoeboxes saying "Disregard all fitness benefit claims." But the box I was reading was an adult shoe, unrelated to the teen advertising cartoons, and the sign isn't a sticker -- it's part of the printing on the box. So it's a mystery. To be honest, I was already primed to disregard any fitness claims I read on the front of a shoebox. But I guess it's glad that the company uses valuable advertising space to remind everyone to discount the company's own claims.